Imperious khans and assorted dignitaries gaze into the distance. Meanwhile, fierce battles are raging all around. These are scenes from artworks at a recently opened exhibition in Kazakhstan, representing a reimagining of key events in the nation’s history. The A. Kasteyev Museum of Art – Kazakhstan’s leading art gallery, situated in Almaty – commissioned the works as part of a national competition to create a pictorial representation of Kazakhstan’s past. The idea for the contest came about after the museum discovered a significant gap in its collection: it had almost nothing on Kazakhstan’s history. 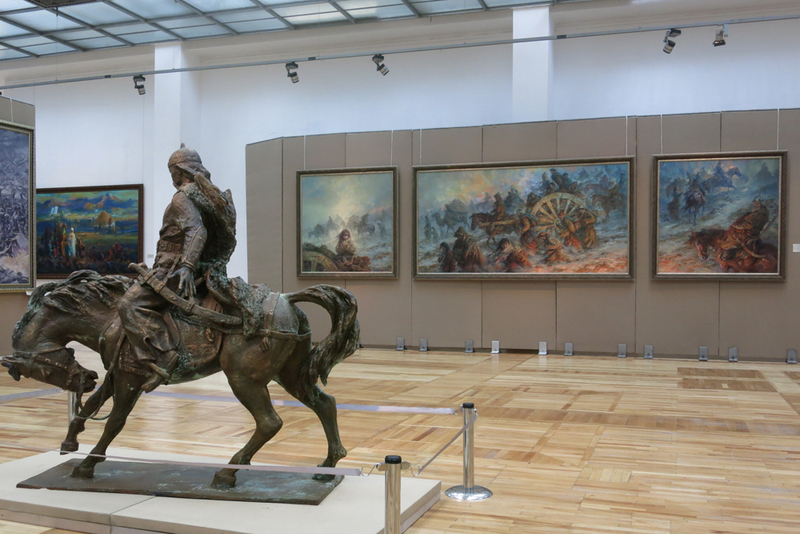 “We had thousands of paintings and sculptures of Soviet Realism, or Socialist Realism … but we didn’t have anything about Kazakh history,” Clara Isabayeva, head of the museum’s Foreign Relations Department, told EurasiaNet.org. The exhibition features stirring battle scenes, visits from Russian envoys, tragic national disasters, and portraits of the khans and sultans who once ruled over these lands, as well as other public figures from down the ages. A 15-person panel of art experts selected the winning entries on the basis of artistic merit. The paintings are predominantly in a conservative and didactic style that bears strong resemblances to the Socialist Realism genre that dominated the art scene of the Soviet Union until the late 1960s. The winner of the competition carries a familiar name. Dauren Kasteyev is the grandson of Abilkhan Kasteyev, after whom the Almaty museum is named. Abilkhan Kasteyev, who died in 1973, a couple months short of his 70th birthday, is widely acknowledged as the father of art in Kazakhstan, and is best remembered for his Socialist Realist interpretations of the nation’s communist period. Dauren Kasteyev’s winning entry was a triptych called Aktaban Shubyryndy, in English The Years of the Great Disaster – a reference to the fratricidal 18th century wars among ethnic Kazakhs that almost drove the nation to the point of annihilation at the hands of their longtime enemy, the Zhungars. Another eye-catching work providing a glimpse into Kazakhstan’s tortuous path to independence – Vyacheslav Tseitlin’s Independence Bequeathed by Ancestors, or Alash Orda – takes in disparate events like the Zheltoksan protests of 1986, nuclear testing at Semipalatinsk and figures from the Alash Orda provisional government that ruled from 1917-1920. President Nursultan Nazarbayev, the only post-independence leader the country has ever known, also makes an appearance in this pantheon of illustrious figures and is shown in the top left-hand corner of the painting, posing beneath iconic buildings in Kazakhstan’s capital, Astana. This use of art and sculpture may be the latest contribution to an ongoing nation-building narrative, but it is an important one, said Rico Isaacs of Oxford Brookes University, who has made a study of how culture has been used as an identity-building tool in Kazakhstan. “When governments embark on a nation-building project, as the Kazakhstani government is, visual mechanisms such as art and sculpture play a fundamental role in providing for the imagination of the nation, through landscape, allegories, commemoration, historical events and national heroes,” he told EuraisaNet.org. Art also acts as glue that can help bond disparate groups together. “Art is important for Kazakhstan because it is visually intimate, it benefits the Kazakh nation as it allows people who have never met one another, but who live in the same territory, to visually imagine they belong to the same community and that they share the same common history, myths and heroes. Art, when utilized properly, can foster the ethno-national bond within nations,” Isaacs said. This is not the first time that Kazakhstan has harnessed culture to bolster patriotic feelings. There has been a significant investment in opera and ballet, with the $320 million Astana Opera opening its doors in 2013. The repertoire includes the popular ballet, Karagoz (“Black-Eye”), a Romeo and Juliet-style tale set on Kazakhstan’s rolling steppe, and Kyz Zhibek, a lavish opera that is another tale of star-crossed lovers on the steppe and features live horses and camels. The pressing need to ramp up the nation-building efforts was driven home in 2014, when Russian President Vladimir Putin cast doubt on Kazakhstan’s durability as an independent state in remarks made following Moscow’s annexation of Crimea and the outbreak of hostilities in eastern Ukraine. The following year, Kazakhstan made an ostentatious show of marking the 550th anniversary of the establishment of the Kazakh Khanate, a proto-Kazakh state set up by two khans, Kerey and Zhanibek, in 1465. The story of the Kazakh Khanate is an important part of the current government’s attempts to present a national idea of a unified state with deep roots. “At the time of the collapse of the Soviet Union, ethnic Kazakhs were in a minority in Kazakhstan. Since then the government has sought to develop the idea of the ‘Kazakh’ nation as a way to try and embody a sense of national unity and common sense of belonging to a shared historical past,” Isaacs said. To further establish this sense of a shared past in the minds of the general public, the tale of Kerey and Zhanibek has been turned into a 10-part TV series, which is due to be broadcast soon. Elements of the tale are featured in the movie Almas Kylysh (The Diamond Sword), which was released in January. With Russian MPs once again making noises about Kazakhstan’s territorial integrity, Kazakhstan will need to keep pushing this national idea of a common shared history, Isaacs said. “Events in eastern Ukraine, coupled with incendiary comments from Russian Duma deputies, which question Kazakhstan's sovereignty over the northern part of the country, make the promotion of this national idea very important at this time,” he said. Paul Bartlett is an Almaty-based freelance writer.